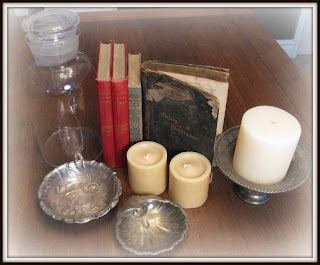 I'm joining Rhoda's party today and showing off my recent thrift store finds. I seem to be having an attraction to all things vintage. The old stuff like books, bottles, and silver seems to bring such a feeling of romance. That vignette of vintage things is beautiful! I love old stuff too...I like to imagine who bought it originally and where they put it/what they did with it. I AGREE....I LOVE the old things. I haven't always felt this way...years ago, when I was much younger, I passed up some really neat things that belonged to relatives because they didn't appeal. I could kick myself now. I love old books, and have started a collection just recently. The picture in your header is just beautiful! You are not alone with you love of vintage, great finds! Joy, you always find some great stuff out there! Thanks for joining the party. Vintage books, bottles & silver = romance. My kind of math. I love your finds...such great candles....they are hard to find in such great un-used shape ! All of my favorite things...love the silver.